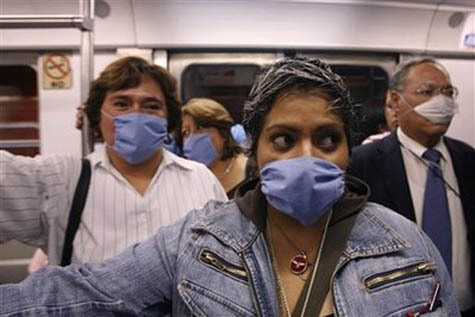 [Image: "People wear surgical masks as a precaution against infection inside a subway in Mexico City, Friday, April 24, 2009." Photo by AP Photo/Marco Ugarte]. 1) In his under-appreciated novel Super-Cannes, easily amongst his best, J.G. Ballard explored the psychological, sexual, and even epidemiological implications of landscape design. This is "the secret life of the business park," Ballard writes. At one point the book's narrator is speaking with the corporate director of Eden-Olympia, a planned live/work community in southern France. The director somewhat off-handedly refers to medical research that the narrator's own wife, a doctor, has been performing: "She's running a new computer model," the director says, "tracing the spread of nasal viruses across Eden-Olympia. She has a hunch that if people moved their chairs a further eighteen inches apart they'd stop the infectious vectors in their tracks." Perfectly calibrated down to the inch – or perhaps the millimeter – modern space itself becomes a kind of medical regime, its bare white rooms an antiviral treatment that we mistake for interior design. Just as our city streets are wide enough to accommodate the turning radius of a specific class of passenger vehicle, our office cubicles, kindergarten playrooms, courts of law, and university lecture halls could be measured against the infectious vectors of specific pathogens. In the geometry of objects around us are the outer infectious edges of diseases we no longer suffer from; we have literally designed them out of modern space, denying their ability to spread. 2) You go to the Salone del Mobile next year in Milan and discover that the CDC has unexpectedly released a new line of furniture. Each piece varies just slightly from the rest, in that their measurements have been dictated not by human comfort, international rates of shipment, or even by industrial timber specifications, but by the distances medically necessary to maintain between yourself and others in order to avoid respiratory infections. The common flu is now a dining table measured exactly against the reach of sneezes; SARS is a cubicle lined with an industrial felt that absorbs all coughs; pneumonia is a bar stool, hand-crafted from white pine, with a circumference of rails to prevent people getting too close. 3) The recent outbreak of swine flu in and around Mexico City and the U.S. border region, is "suspected of killing at least 60 people," the BBC reports. In fact, the outbreak "has the potential to become a pandemic," according to Margaret Chan, current director of the World Health Organization. Chan has "confirmed the virus was an animal strain – a mixture of swine, human and avian flu viruses," which the BBC points out "is a classic 're-assortment' – a combination feared most by those watching for the flu pandemic." 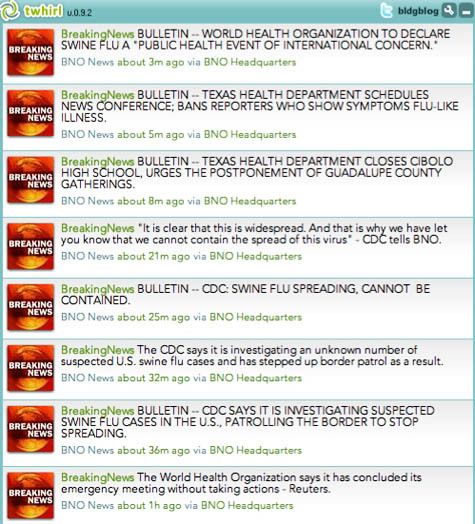 [Image: Like the beginning of a zombie horror film, we read – via Twitter – "SWINE FLU SPREADING, CANNOT BE CONTAINED" (via @alexismadrigal)]. It's interesting to note, however, that swine flu, unsurprisingly, comes from "close contact with pigs" – that is, spatial proximity between humans and their livestock. Swine flu, we could say, is a spatial problem – an epiphenomenon of landscape. I'm reminded here of a point made recently by geographer Javier Arbona. Referring to the increasingly popular and somewhat utopian idea that, in the sustainable cities of tomorrow, agriculture will have returned to its rightful place in the city center, Arbona asks: "Did everyone think that so much lushness and farming envisioned in the city aren’t going to open up new Pandora’s boxes of infectious diseases and sanitation problems as we come into contact with more manure, more bacteria, and more wild animals that we urbanites are not at all 'naturalized' to?" It's an important question. After all, it's incredibly easy, reading about sustainable cities, urban agriculture, and even the locavore movement, to conclude that chickens, pigs, cows, etc., have all been removed from the urban fabric as part of a profiteering move by Tyson and Perdue. But there were very real epidemiological reasons for taking agriculture out of the city; finding a new place for urban farms will thus not only require very intense new spatial codes, it will demand constant vigilance in researching and developing inoculations. Few people want to see burning piles of livestock in Times Square or Griffith Park, let alone piles of human corpses infected with H5N1. Indeed, one of the most prevalent, if mundane, reasons why avian flu has become a "global threat" to humankind, as Mike Davis refers to it in his book Monster At Our Door, is space: it sounds like a joke, but people are living too close to their chickens (or their pigeons, as the case may be). Avian flu, foot-and-mouth disease, swine flu: if these are spatially activated, so to speak, and spread through certain unrecommended proximities between humans and animals, then urban design's medical undergirding is again revealed. The space around you is no mere architectural stylization; it is a strategy of containment. The modern city would thus not only be a place to live – it would also be a functioning medical instrument. 4) This brings to mind Marina Nicollier's final thesis project at Rice University, wherein she explored the medical effects of architectural design. In other words, at its origins, modern architecture was a kind of medical prescription – not a pill you swallowed but an environment you surrounded yourself with. This idea, of controlled exposure to specific architectural forms, makes the equation between built space and medical treatment explicit. How, then, might we expand and re-apply this research to whole cities in an era of swine flu and SARS? 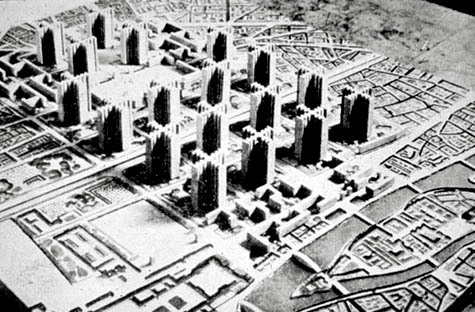 [Image: Le Corbusier's Plan Voisin for Paris]. 5) The medical aspects of utopia seem under-explored in contemporary urban literature. Here, utopia could be retheorized as the city where no one gets sick. Through microbe-resistant building materials and a precisely measured anti-contagious spatiality, perhaps, your metropolis might even cure you. Utopia becomes a hospital ward the size and shape of a city. Perhaps BLDGBLOG should sponsor a new urban design competition in which only medical doctors can participate. Design your vision of the healthy city, these doctors will be told; what urban forms will result? Briefly, I'm reminded of BLDGBLOG's 2006 interview with Mike Davis. Referring, again, to his book Monster At Our Door and its exploration of biosecurity, I asked Davis: "What would a biosecure world actually look like, on the level of architecture and urban design? (...) Do you see any evidence that the medical profession is being architecturally empowered, so to speak, influencing the design of 'disease-free' public spaces?" Davis replied that this was "exactly how Victorian social control over the slums was defined as a kind of hygienic project – or in the same way that urban segregation was justified in colonial cities as a problem of sanitation. Everywhere these discourses reinforce one another." The fact that this week's swine flu outbreak originated in Mexico seems doubly interesting in this context. You can check out the interview for the rest of Davis's answer – but I still think the question of urban biosecurity deserves more architectural attention. If the Centers for Disease Control could design a city, what would it look like? Could there be a medical equivalent of Baron Haussman or Robert Moses? What is medical urban design? 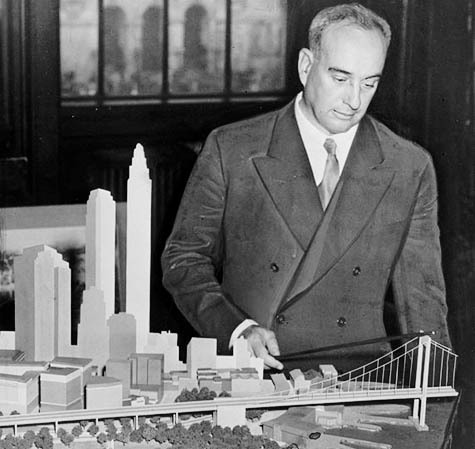 [Image: Robert Moses stands above a model of the city he would create; via Wikipedia]. 6) Producing a disease-free city, of course, requires the proper design tools. Via Twitter (@qimet888), I was pointed toward a demonstration program: Dynamical Network Design for Controlling Virus Spread. The clunkily-named program "shows the dynamics of the spread of the SARS virus in Hong Kong's 18 districts when the optimal resources allocation is used." 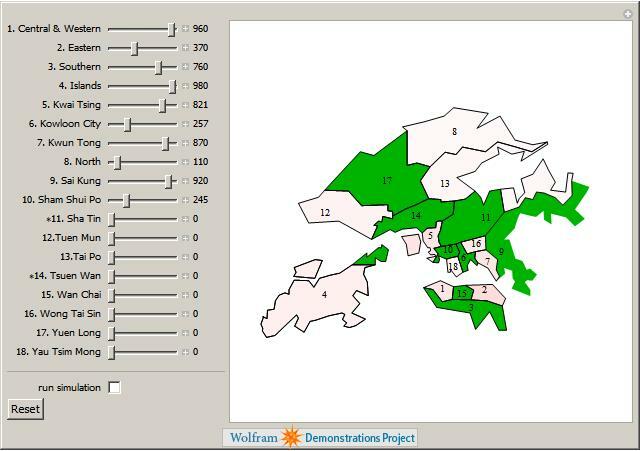 In the simulation, the color green represents an infection-free district, that is, one in which the number of infected people is smaller than one. For infected districts, shades of red are used to indicate the level of infection. Darker red means that there are more infected people in the region and lighter red means that fewer people are infected. The viewer can see that the virus is stopped very quickly using the optimal design: the regions quickly turn green regardless of the initial conditions. The implication seems clear: toggle your parameters – move people, buildings, walls, hospital wards, sewers, etc., around until you find the right combination – and your city itself might help to eradicate disease. It would "stop the infectious vectors in their tracks," as Ballard wrote. [Image: Of SARS and the city: from Wolfram's Dynamical Network Design for Controlling Virus Spread]. 7) Why not turn this into a game? Design the ultimate disease-free city: SimCity: Dark Winter, Urban Outbreak, or even a biomedical version of Settlers of Catan. Your goal is to redesign a city in real-time in order to extinguish a burgeoning plague epidemic. Perhaps SOM could sponsor it – and own rights over the winning results – in an attempt to corner the market in infection-free city planning. You could even reverse the game's moral order and require players to create the ideal city for disease transmission: whoever kills off their entire game's population in the shortest period of time wins. The all-time winner infects the world in less than a second. 8) All of this occurs as I've been reading Steven Johnson's book The Ghost Map. The book consistently raises the issue of public health as an urban design concern – and, at the risk of repeating myself here, it would seem like epidemiology should be a vital part of all city planning courses. Spatial epidemiology, in fact, seems so interesting, and so important, that I'm almost tempted to go back to school for it. A great final thesis would be a series of test landscapes – epidemiological prototypes – in which hypothetical diseases run their course against a landscape of airlocks and plastic sheeting, chairs moved 18" further apart, walls erected where there once were screens, and sewers buried another three feet deeper underground. Pushed too far, one of the resulting landscapes becomes completely abiological, incapable of supporting life, sterilizing everything through the design of space alone. In any case, Johnson's book is an impressively multi-scalar look at how apparently simple urban design decisions can produce very tragic effects in indirect arenas, elsewhere. Add to this demographic information about who lived where in London at the time, the economics of things like 19th-century water delivery, and the changing nature of medical treatment, and you get a fascinating look at how certain cities either cultivate or effectively stop the spread of diseases. In the face of very real medical concerns, I might suggest that designing our cities according to historical expectations – let alone according to the spatial needs of the automotive industry – has never seemed quite so arbitrary. 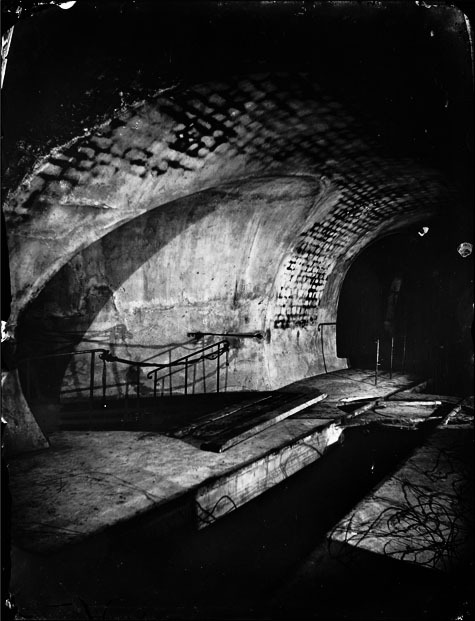 [Image: The sewers of Paris as photographed by Nadar; taken from an article by Matthew Gandy]. 9) With apologies for a brief personal anecdote, I was in Paris for a week in the fall of 1997; having just read Foucault's Pendulum for the second and third times, respectively, earlier that summer – somewhat inexplicably, I've read that book nine times now – I decided to take a tour of the Paris sewer system. My "tour group," such as it was, consisted solely of myself and another American backpacker, who had just finished reading The Coming Plague by Laurie Garrett a few nights before. Doing so apparently made him obsessed with cancer; it was the only thing he talked about. As the two of us walked through the unbelievable stench of Parisian wastewater, watching used condoms float by and rats crawl away in the darkness ahead, and while we listened to the slightly bemused narration of our female tour guide, the backpacker began telling me about the possible viral nature of cancer, the incurability of certain forms of the disease, and the inevitability that most of us would, in the end, develop it. Strolling around through fecally-contaminated vaults beneath the city, discussing the history of urban sanitation amidst unhinged speculations about the possibly infectious nature of certain types of cancer, I could joke that the tour's end didn't come fast enough, but I was fascinated. Between experiential urban infrastructure, Victor Hugo's subterranean chase scene in Les Misérables, and an overwhelming desire to spray myself with deodorant, it nonetheless could have been the ideal setting for a walking salon, so to speak, a conversational meeting of the minds about disease and the city. Call it The Dante Project™: get doctors from around the world together in Paris every year for a series of long strolls through the well-sewered underworld. Swine flu, cholera, H5N1, cancer, AIDS, ebola: never again will they be as viscerally reminded of what they've devoted their lives to cure. 10) In the end, then, what spatial form might a medical utopia take, and how could it be architecturally realized? In 50 years will you be walking around the edges of the city with your grandkids when one of them asks: Why are these buildings out here, so far away from the rest? And you'll say: They're here because of swine flu. We redesigned the city and our diseases went away. The current virus of interest is apparently H1N1. There are a number of flu strains with pandemic potential, not just the H5N1 strain you mention. Zombie, the post refers both to swine flu and to H5N1, without equating them; it discusses both diseases. Thanks for pointing it out, though, as you are indeed correct: the recent swine flu outbreak is an outbreak of H1N1. You mentioned about proximity to animals. However, I think in this latest case of swine flu, it's spreading human to human. "The CDC said none of the seven people were in contact with pigs, which is how people usually catch swine flu. And only a few were in contact with each other." And New Scientist has also reported that the disease "can transmit among people." Specifically: "Those infected in the US had no known contact with pigs, and the three separate clusters of cases did not contact each other. This suggests, said Besser, that 'this virus has already been transmitted from person to person, for several cycles,' making it too late for emergency antiviral drugs to contain its spread to a limited area." But the very idea of swine flu necessitates the originary presence of pigs, even if the resulting virus has mutated beyond that initial form of transmissibility. From the CDC: "Swine Influenza (swine flu) is a respiratory disease of pigs caused by type A influenza that regularly cause outbreaks of influenza among pigs. Swine flu viruses do not normally infect humans, however, human infections with swine flu do occur, and cases of human-to-human spread of swine flu viruses has been documented." So whilst I might have over-stated the case, the way I understand it is that the original pig-to-human transmission (which presumably occurred somewhere in Mexico, judging from news reports) occurred because of spatial proximity between infected pigs and human beings. While I don't know the details of your conversation with your backpacker sewer-tourmate, it's interesting that you write off his conversation as "unhinged speculations about the possibly infectious nature of certain types of cancer". If in 1950 you suggested that stomach ulcers were caused by bacteria, you'd probably have been laughed at — and yet that turned out precisely to be the case. Given that we've had things like parasites causing behavioural changes in fish and even mammals, changing their behaviour to suit the needs of the parasite, I wouldn't be so bold as to pre-judge whether viruses are to blame for... well, many things. I think that the proximity between humans and animals is only one of several significant proximities. The proximity between large numbers of animals probably also plays a role. As I understand it, the threat of new diseases is made more acute by the techniques of modern intensive farming; the sheer numbers and concentration of animals, the physiological stress of drugs and hormone treatment, and the lack of genetic diversity within the population all contributing. From the point of view of creating a 'healthy' landscape, dispersal of animal populations might be a significant consideration. Davis: Exactly: it’ll be smuggled over the border – which is absurd." No need to smuggle. Conditions already exist. Some people are puzzled as to how human, pig, and bird strains of the flu have mixed together, but if you have spent any time in rural Mexico the answer is obvious: these creatures all live together in close quarters. What worries me, personally, is that many of their cousins keep chickens in their backyards here in the densely populated San Fernando Valley. I don't know how many keep pigs, but I wouldn't be surprised." Seems to me that any city relatively dependent upon personal automotive transportation would have an advantage in avoiding infectious disease outbreaks. The U.S. Embassy was specifically recommending that visitors to Mexico avoid subways and buses, right? Imagine how many fewer potential exposures one endures within the near-airtight confines of a private car. Unfortunately, automobile dependence is likely an important root cause of many other (often chronic) diseases and conditions. Obesity from lack of utilitarian exercise, asthma from motor vehicle exhaust, and many, many injuries from car crashes. So, what's the answer? I vote for more bikes! "some people are puzzled as to how human, pig, and bird strains of the flu have mixed together, but if you have spent any time in rural mexico the answer is obvious: these creatures all live together in close quarters"
that sounds more like xenophobic fear than virus mutations explanations. "on february 5, 1976, an army recruit at fort dix said he felt tired and weak. He died the next day and four of his fellow soldiers were later hospitalized. two weeks after his death, health officials announced that swine flu was the cause of death and that this strain of flu appeared to be closely related to the strain involved in the 1918 flu pandemic." Thank you for your connecting spatial epidemiology and urban planning. I share your concerns on the question of urban biosecurity and do think it deserves more architectural attention. I am currently in Mexico City and the situation reminded me of urban planning in the context of our disease-free consultancy program for urban developers where we introduce them to the ancient wisdom of city planning revived in Maharishi Sthapatya Veda (or vastu). The knowledge was traced as the origin of Feng Shui which it predates by thousands of years. It also seems more fundamental in its approach and implementation, prescribing urban planning rules according to natural law, and incorporating spatial "strategy of containment" of influences destructive to human health. Of course, this alone may not be enough to create disease-free cities, so we're recommend the implementation of appropriate preventative healthcare and sustainable agriculture based on soil fertility improvement to achieve disease-free urban environments and local food production that in turns is better for human health and the planet. We probably do need to go back to school and unlearn our common knowledge of city planning and discover plain common sense, the latest in green technologies and integrate ancient wisdom. With this in mind, why not think of a global reconstruction process which will benefit humanity in every way, healthwise, jobwise, happinesswise. Again, thanks for taking the time to share this article. Fascinating stuff. There's been recent discussion of the idea of obesity as having epidemiological characteristics, and also that obesity might be combatted by urban design. Your post is the first thing I've seen that offers a framework for connecting the two, though - something I really want to explore in a blog post myself. Could this language of disease and epidemic increase the impetus for walkable healthy cities? That said, atomised car-oriented life in the suburbs is great for preventing epidemics like influenza, and yet diametrically opposed to obesity prevention -- so there are some tricky compromises to make. This is officially the first time I can say that I'm happy to live in the suburbs. No human contact for days? Sure! Need to use motor vehicles that isolate me from the environment in order to get anywhere? Excellent! Who'd have thought that urban sprawl would save us? Great blog. Took me about nine hours to read! Had you been planning this blog entry pre-swine-flu-mania? It's extremely well thought out and executed. Great work! Love the post. Hopefully you would still allow lice into your hyper-hygenic city though because I hear they reduce the chances of getting asthma. Great post Geoff. I thoroughly enjoyed reading it. My comment here is about an aspect of epidemiology that I think you missed. Communicable diseases are not just spatial, but also temporal. They have an incubation period, a symptomatic period, and a post-infection period. Irregardless of how well a city might be designed, time is one of the most important factors that needs to be considered. A different architecture design competition might be one that involves designing airports for temporary sequestration of travelers. As in, before you can set foot outside of the airport, and potentially spread a communicable disease, one must have a secondary layover in a private room to ensure that the potential communicable disease is not spread any further. Designers might be able to move desks and couches a safe distance, but if people are able to travel unencumbered then communicable diseases will always follow. Nearly all the current cases are from those who visited Mexico City, but what if travelers had to wait a couple days before leaving the airport? Coming back from Spring Break might involve a secondary Airport Break, but at least this would cut down on the global movement of life threatening diseases. Wow, a really well thought out article putting an angle on the situation that I had not thought of. How do you write such long relevant articles in such a short space of time? BLDBLOG is fast becoming one of the first sites I turn to when I switch on the PC in the morning. Good stuff. Hi Geoff, fascinating post, thank you. Baudrillard (everyone's favourite mad Frenchman) wrote that "Cities ... distinguish themselves through a certain order of catastrophy relative to them, constituting in each case the keen fascination of the city in question. For New York it is ... black-out and the vertical bombardment. Towering inferno. Los Angeles represents a horizontal break and the gliding away of California into the Pacific." (The Seismic Order 1991). Some scattershot thoughts: I wonder how the idea of a city spatially designed to resist a 'certain order of catastrophe' settles in the psyche of its inhabitants; do we open up a pre-catastrophic space that is just as traumatising in anticipation as it is in realisation? [there's some really great writing on this by a guy called Paul Saint Amour at University of Pennsylvania]. How will we know the epidemic when it comes, if at all? The Japanese use the term 'Bukimi', a sense of the ghastly or uncanny, to describe the feeling that Hiroshima had been reserved for a specific sort of disaster in WWII. 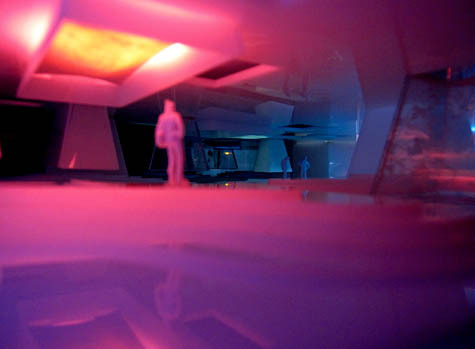 In designing spaces in response to apocalyptic imagination, are we preserving the futurity of the the disaster's arrival (by preventing it), or conditioning people to experience a kind of pre-traumatic stress? In the case of atomised, 'silent' disasters like global warming and epidemiological threats (which have no single, pyrotechnic event but happen in imperceptible increments) it becomes even harder to distinguish spaces that are safe from spaces that are unsafe. All the deserts look like irradiated test sites, all the test sites look like deserts. The airport may be empty because it is quarantined to prevent the spread of disease, the airport may be empty because everyone is already too sick to travel. The line between the pre and the post catastrophic landscape (built or natural) is more porous than ever before. It interests me that new places not only grow around a nucleus of imagined disaster, but existing places are reinterpreted through the expectation of disaster. Here in Australia we stand on the edge of the country, looking out over the surf breaking and receding and say 'in a decade this will all be underwater'. How this shapes our spatial interpretation and representation (before any kind of active spatial construction takes place) is, in my opinion, fascinating. Thanks again. I really like the idea of redesigning cities to prevent disease. I also think, while we're at it, we can redesign our cities so that we don't need so many cars, and old people can have better access to public spaces. But, I think, in this case, what really needs redesigning is how we farm pigs. If we redesign our cities, but we still keep in place the brutally cruel industrial farms, we will still have a blot on our conscience. The idea that urban agriculture could promulgate such phenomena as the swine flu is naive. In the past urban sanitation banned pigs because of the high density of people to pigs. In today's society there are known risks and manageable strategies to avoid the centralized petroagricultural system. The public health risk of disease spread through monoculture effectively wiping out our food supply is a compromise society should make for healthier, local, and fresher food. one is of course reminded that foucault begins (alright, not begins, continues, elaborates) his thoughts on the spatiality and temporality of bio-politics with the plaque. and it is really, really hard to imagine all those 'new' colonial towns without the rhetoric of health being a thin veil for overt racism, classism (uh hum, mexico). not to end on dystopian note (although that would be rather proper), it does seem fertile to explore the liminal clusters of contagiousness, all the various modern moments of 'nonplace' that are the 'vectors' of epidemiology: airplanes, bus stations, the rise of kiss & ride, the dabbawala, etc. What! A biomedical version of Settlers of Catan? !